Foreign policies have always played an important role in the movements of migrants. 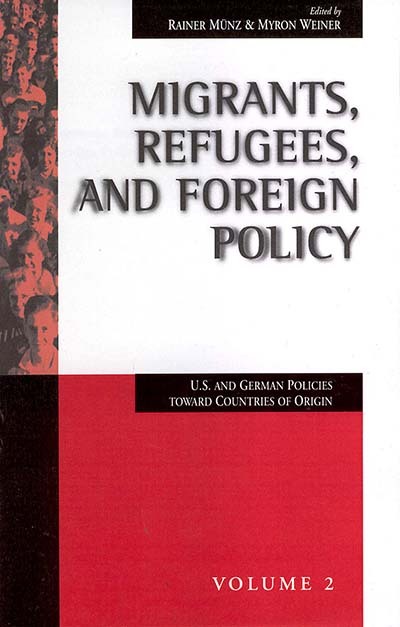 A number of essays in this volume show how the foreign policies of the United States and Germany have directly or inadvertently contributed to the influx from the former Yugoslavia, Mexico, the Caribbean, and the former Soviet Union. Now being faced with growing resistance to admit foreigners into their countries, both governments have once again been using foreign-policy instruments in an effort to change the conditions in the refugees' countries of origin which forced people to leave. This volume addresses questions such as which policies can influence governments to improve their human rights, protect minorities, end internal strife, reduce the level of violence, or improve economic conditions so that large numbers of people need not leave their homes. Rainer Münz is Head of Research & Knowledge Center (Erste Group), Non-resident Fellow of the Migration Policy Institute, Washington DC, and Senior Fellow at the Hamburg Institute of International Economics (HWWI). He studied at Vienna University, where he earned his PhD in 1978. In 1979 he joined the Austrian Academy of Sciences. Until 1992 he was director of the Institute of Demography at the Austrian Academy of Science. Between 1992 and 2003 he was head of the Department of Demography at Humboldt University, Berlin. He was visiting professor at the Universities of Bamberg (1986), University of California at Berkeley (1986, 1989, 1997-98), Frankfurt (1988), Klagenfurt (1996, 1998), Vienna (2001-02) and Zurich (1992). He also was Senior Research Fellow at the Department of Mathematics of Finance, Technical University Vienna (2001-2002). Since 2010 he teaches at the University of St. Gallen. His main fields of research are European Migration, ethnic and linguistic minority issues, and the impact of demographic change on social policy. Myron Weiner† was Ford International Professor of Political Science at the Massachusetts Institute of Technology and former director of the MIT Center for International Studies. He is authored and edited numerous books on India, on political change in developing countries, and on international migration. These include Global Migration Crisis: Challenge to States and to Human Rights (1995), The New Geopolitics of Central Asia and its Borderlands (1995), Threatened Peoples. Threatened Borders: World Migration and U.S. Policy (1995), The Politics of Social Transformation in Afghanistan, Iran, and Pakistan (1994), International Migration and Security (1993), The Child and the State in India: Child Labor and Education Policy in Comparative Perspective (1991), The Indian Paradox (1989), and Understanding Political Development (1986). Professor Weiner has taught at Princeton University, the University of Chicago, and Harvard University and held visiting research appointments at the University of Paris, Hebrew Univeristy, Delhi University, and University of Oxford. At MIT he chaired the Inter-University Committee on International Migration. Dr. Weiner was chair of the External Research and Advisory Committee of the United Nations High Commissioner for Refugees from 1996 until his death in 1999. Chapter 9. Can Military Intervention Limit Refugee Flows?